This is a bit of an unusual choice for a Super Bowl snack (they wouldn’t sue me, would they? ), but I’ve already done multiple kinds of wings and meatballs on this site. Bear with me as I take you through my creative process: first, Chobani asked me to come up with a Super Bowl snack that 1.) uses yogurt, and 2.) is served in a bowl – so I had those parameters. I wanted to get pretty creative with this since it’s a little bit of a challenge, so I decided to steer away from a dip. A trifle isn’t the most original use of yogurt, but have you ever seen a manly version of trifle? I know I haven’t – so that’s what I’m attempting here. And since the Super Bowl is a national drinking holiday, I figured I’d use the flavors from one of my favorite cocktails: the Manhattan. If you’re not familiar with this delicious classic cocktail, it’s made of bourbon, bitters, vermouth and garnished with orange and cherry. At first, I wanted to make this simple, but just buying spongecake at the store didn’t really feel right to me. 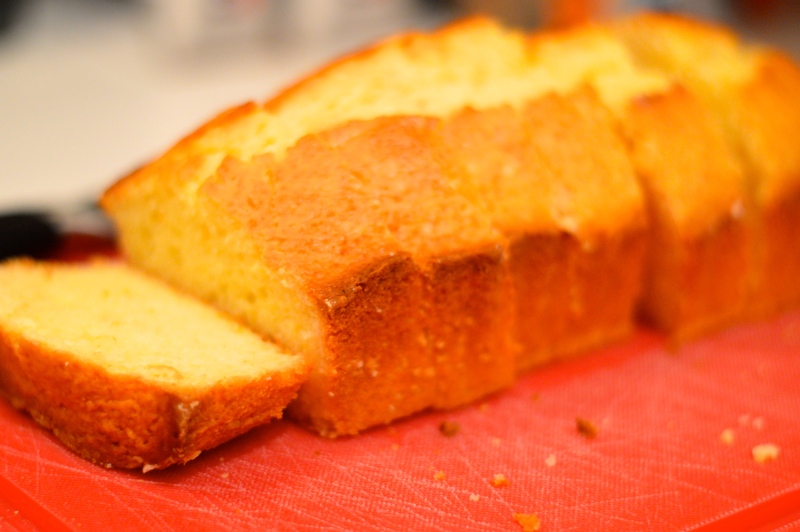 I ended up factoring Chobani yogurt into a sort of poundcake that I made specifically for the trifle, and I subbed in orange zest to act a little like the orange peel that garnish. The cake got sliced soaked in bourbon – the base of a Manhattan. Then, I whipped some honey and lemon zest into plain Chobani yogurt, which I layered throughout the trifle with my bourbon-soaked Chobani pound cake and macerated fresh cherries. Top it off with a little orange and more cherries, and that’s trifle that a man can be proud of. This recipe is definitely kind of a process, so I would recommend spacing it out over a couple of days, especially since it’s better firmed up in the fridge overnight. Start now to get it done by Sunday! And thanks to Chobani for inviting me to participate in this promotion – be sure to share this using #deliciousbowl and #chobani. Preheat oven to 350 degrees. Coat the inside of a standard loaf pan with a thin layer of vegetable oil, then sprinkle it with flour. Whisk together flour, baking powder and salt in a large bowl. 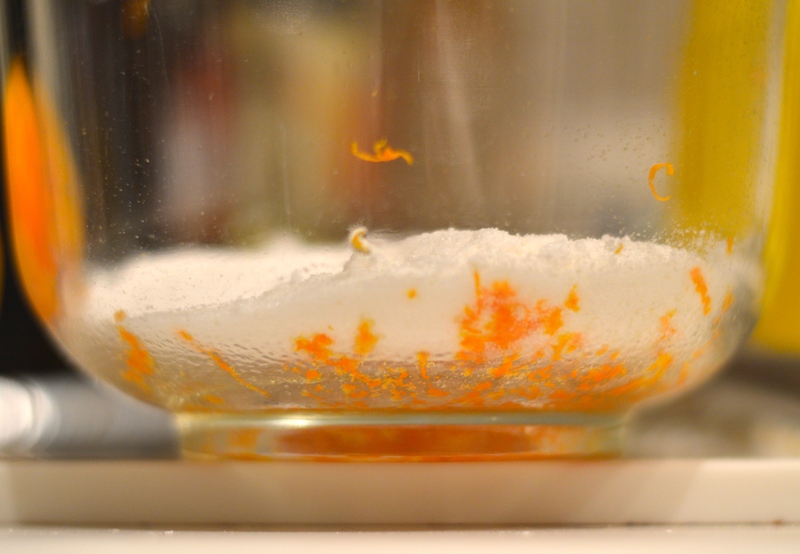 In a separate, medium bowl, mix together orange zest and sugar until the sugar looks moist and orange-y. Add the yogurt, vegetable oil, eggs and bourbon to the sugar mixture and whisk to combine. Add the wet ingredients to the dry ingredients and stir until combined, but don’t over-mix. Some lumps are fine. Pour into prepared loaf pan and bake for 50-55 minutes. Remove the cake when it has risen and is golden brown on top. Turn oven to 300 degrees. Mix together the yogurt and honey in a small bowl, or in the yogurt container itself. Mix pitted cherries and brown sugar in a separate bowl. Slice yogurt cake into 1-inch pieces, then toast these pieces in the oven for 10-15 minutes, until well-browned and dry. Pour a little bourbon on each piece so that the toasts soak it up like a sponge. A little more or less bourbon won’t hurt, depending on your taste, but don’t over-saturate the pieces – that will make the final product too liquid-y. In a large serving bowl, begin to assemble the trifle. Dollop in some of the yogurt mixture to just cover the bottom. Layer the cherries on top, the place cake slices on the cherries. You may need to break apart a slice or two to make an even layer of cake in your circular bowl. Dollop the rest of the yogurt on top of the cake. Garnish the top with the rest of the cherries, another crumbled slice of cake and some more orange zest. Serve without embarrassment. So yummy and would definitely eat this as a Superbowl snack! It looks scrumtrulescent, to say the least. You just can’t go wrong with bourbon. This looks awesome! Definitely make this for my Super Bowl party. Looks so good and easy! 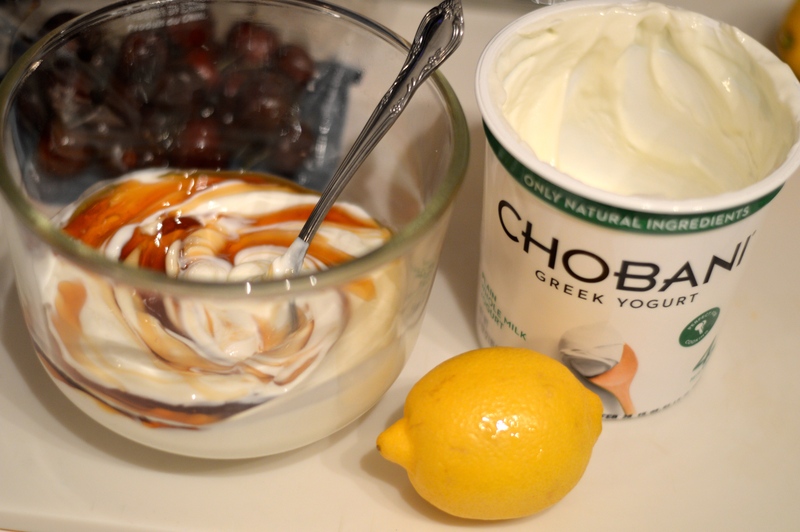 Love that it included bourbon and Greek yogurt–two of my favorite things! This looks delicious! And now I’m thirsty for happy hour. Can’t wait to try it! Yum, trying this on Sunday! !